If you’re a small business or startup owner, you’ve likely heard the benefits of using social media marketing. How do I execute an effective social media marketing strategy? What if I have other, more pressing priorities – can I ignore social media and hope it goes away? How do I really know my strategy is working? The solution: Create a social media content plan – that works. If social media were a pizza, content would be the dough. It’s the foundation on which your social strategy is based, and the tool through which you’ll humanize your brand to your customers. Posting random content and hoping that it resonates with your audience is like shooting a basketball with a blindfold on. If your customer base consists of baby boomers seeking industrial-sized washing machines, they probably won’t find your Kardashian memes particularly endearing. Luckily, having a content plan in place ensures that the information you share is valuable to your readers – keeping your audience engaged, loyal, and growing on the daily. Read on for more details on how to create an overarching content plan without losing your hair…or mind. Anyone can share content on their social media pages – the hard part is sharing content that resonates with your readership. To get this right, you need to understand your audience as well as you do your own business. If this sounds like you, go on to Step 2. But, maybe you have yet to define your customer persona. There are a myriad of tools to help you gain insights into your customers’ behaviors – including on social media! Facebook offers lots of great demographic information, organized by user action. For example, you can see the ages, genders, and countries of users who have clicked an “Action” button on your page. YouTube provides the ages, genders and locations of your video viewers, in addition to the video Retention Rate (average watch time per video). What’s especially helpful about YouTube is that it allows you to pinpoint the moment your viewers stop watching your videos. Tip: You can use this info to optimize the length of your videos, and make sure to get that call to action in before your viewers are ready to move on. Instagram Insights give demographic information similar to Facebook and YouTube, but they also disclose the specific hours and days on which your followers are the most Insta-active. Twitter’s “Audience insights” dashboard shows you statistics about your followers, including their interests, occupations, lifestyle choices and even consumer buying styles. LinkedIn offers the professional demographics of visitors to your Company Page, like their job titles, industry, company size, etc. In addition to social media, there are a number of (free!) tools out there to help you determine your buying persona. Google Trends – Learn what the cool kids are doing by researching trends. You can search for popular subjects according to your niche, or monitor the searches that are currently trending across Google. Social Mention – This analyzes over 100 social media networks in real time. You can explore and track any topic (including your company name) through its mentions and traction across the social media board. US Census Data Tools – Use these tools to gain an idea of your potential reach – that is, how many people you can reasonably expect to be interested in what you have to offer. Statista – It’s all about the numbers. You can find a bunch of statistics on over 600 industries, with graphs that make the information easily digestible. – Are you trying to bring new leads to your website and feed your email list? – Do you want to increase brand awareness overall? – Are you after retaining the happy followers you already have? – Maybe you want feedback from customers and to use social media for communication? – Is the goal to hyper-focus on targeting new customers? Make sure you define your goals for your social media content plan in concrete terms. “Grow a community” may sound nice in theory, but there’s no objective way to calculate success. However, “Increase my Twitter following by 350 people this month” is specific – and measurable. Think of this stage as an extension of your market research. Which social networks has your company used? What kind of response do you get from each one? Is your Facebook page optimized with a cover photo and username? How many retweets do you get on an average Twitter post? Where are your competitors posting? Is the audience digging it? Where are your target customers hanging out? When choosing the social media spaces through which to implement your content plan, bear in mind that each platform has its own personality along with individual strengths and weaknesses. Don’t sweat it – the research on this has already been done for you. For a comprehensive breakdown of each social channel’s typical audience, including number of users, age, gender and more, check out this post from Social Media Examiner and Pew Research. Below is a great overview of some of the main social media players. What does this info mean for your content plan? If you’re driving leads to your website, skip Instagram. If you’ve released a new video, go with Facebook (or YouTube). If you want to share industry news with your followers, LinkedIn makes the most sense. 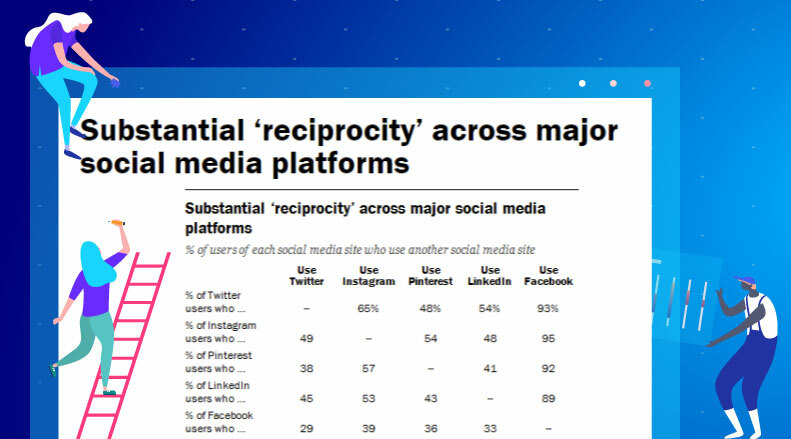 For more specific info on each of the big social media platforms, check out this Pew Research post. That’s a fancy way of saying that your target customer could be on several social platforms at once. In general, there’s no one-size-fits-all to where your audience lives (though note that an average of 92% of all social media users are also on Facebook). Above all, remember to implement your social media content plan on platforms that your target audience responds well to. Time for your content plan to take shape. “Shouldn’t I be posting about my business all the time?” is a question we hear often. Put it this way – no one likes going to a party and getting cornered by the budding entrepreneur who talks your ear off about his million-dollar idea THE. WHOLE. NIGHT. The content in your plan should be relevant to your industry – but not all of it should be about you. Luckily, there are a number of strategies for determining the amount and kinds of content to share on social media. The first option? Just ask your followers. You can create a Twitter or Facebook poll and ask your customers how they prefer to see their content. By knowing what your audience wants and giving it to them, you’re more likely to get positive feedback in the form of retweets, likes and shares. Ask them what kind of content they want to consume through a Twitter or Facebook poll. By knowing what your audience wants and giving it to them, you’re more likely to get more positive feedback in the form of retweets, likes and shares. Remember, content isn’t just text. You can post gifs, illustrated quotes and fun photos – anything that will keep your audience engaged. Tip: For original visuals, modify your own pics with GIMP – a free open-source image editor. Others might include things like How To’s, List Posts, and quizzes in their repertoire – the possibilities are nearly endless. As you can see, good content isn’t just about being a witty wordsmith; post Gifs, illustrated quotes and fun photos to keep things dynamic. Option two: Follow a social media content ratio. Your content ratio is just a rule that you apply to balance the kinds of content you share on your social media pages. Your posts will be consistent, which makes it easy to plan out your content for the coming weeks, months, or year. It ensures your content is varied and relevant. You won’t overwhelm your followers with “too much” of any one kind of post. + posts that you think your customers would enjoy. Get creative! Choose the ratio that works for you and your social needs. Of course, you can always switch it up if you see that some kinds of content resonate more with your audience than others. Remember, consistency is key for your social media content plan to be successful. Find what works for you – and stick to it. Getting this amount of content across various social media channels may seem daunting. It certainly can be – unless you have a content calendar. Stay organized. A calendar is the easiest way to organize your social media content plan. Be consistent. Your calendar ensures consistency, which your followers will learn to rely on. If your content is relevant and engaging, your audience is going to routinely check your pages for new posts – so you better deliver! Save time and resources by planning ahead. You don’t want to scramble every other day to find the perfect post. Take advantage of holidays and special dates. On social media, (almost) every day is a holiday! Don’t miss the opportunity of getting creative on #NationalPizzaDay or #OppositeDay (and, of course, regular holidays like Halloween or Thanksgiving). If it’s whacky and trending, chances are your followers want to see a post about it – putting it on the calendar ensures that this happens. Strategize around company events. Do you have a new product launch in March or an annual event every winter? Planning in advance gives you enough time to generate hype and get everyone on board. Find what works. Refer back to your calendar whenever engagement seems especially high or low to check if there’s a content pattern responsible. It may be time-consuming to create initially, but think of your content calendar as a one-time investment with a never-ending ROI. Once again, the research speaks for itself. Here’s what 23 Studies Say About The Best Times To Post on social media platforms. To sum up: Each social media network has an ideal day and time for posting, depending on the industry. For example, mid-morning works best for healthcare companies posting on Facebook, while B2C businesses would do better posting on Twitter in the early morning or later evening. Plan your posting schedule strategically for more followers, traffic, and to ultimately increase engagement. You know what you’re posting and when you’re posting it – now you just have to get it on virtual paper. To keep it simple, use a spreadsheet. If you want free, ready-made templates in Excel for calendaring, auditing or reporting, check out SmartSheet. Tailor Social – For well-designed, automated posts and optimized scheduling. Buffer-Great if you’re getting your feet wet. Sprout Social– Has an all-in-one platform so you don’t have to bounce between social networks, analytics and reports. CoSchedule– Integrates with blogs and gives reports on social shares and engagement. When you finish, it’s time to start posting to your social media channels! You’ve done the hard part – now you just need to measure your progress. Assessing your performance is key to gauging how well your content strategy is (or isn’t) working. Maybe you’re posting the right types of content but on the wrong days of the week, or maybe your audience responds better to infographics than long-form articles. You can use KPIs as the tool to help you decide how to proceed and keep those conversions coming. Like you saw in Step 1, the social media networks you’re using provide helpful insights into your audience’s engagement with your content. The Facebook graph above shows reach in terms of overall post likes, comments, and shares. Reach = the total number of views your post got from user feeds. If these metrics increase, you’re reaching more people organically. For example: This Hum Rider video reached 35 million viewers on Facebook in less than 48 hours. Unmetric scored this post at 1,000—considered to be the most engaging of the year. Engagement – Unique people who have interacted with your posts. This is measured by clicks, retweets, likes, shares and comments; the higher the number, the more engaged. Referral traffic – Google’s way of reporting visits to your site from outside sources. Referral traffic back to your site is usually seen before conversions. Conversions – People who responded to your call to action and made a purchase. Is social media engagement leading to sales? If not, you’ll need to adjust, test, and monitor your overall content plan. Use analytics to get to know your audience better and give them more of what they love. 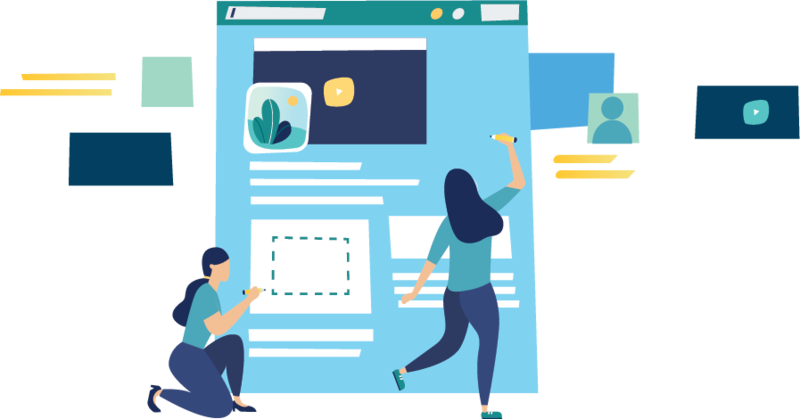 Track each post’s performance, and refer back to your content calendar to see where you’re most successful and how to optimize your content plan for your audience. Note: Tailor Social can be a helpful tool if you want a simplified but comprehensive report of your social media campaign metrics. Do you have a social media content plan for your startup or small business? What actions did you take that generated good results?